For a Harry Potter fan, like myself, it is a dream to visit the Wizarding World of Harry Potter. Not to mention to get engaged there! 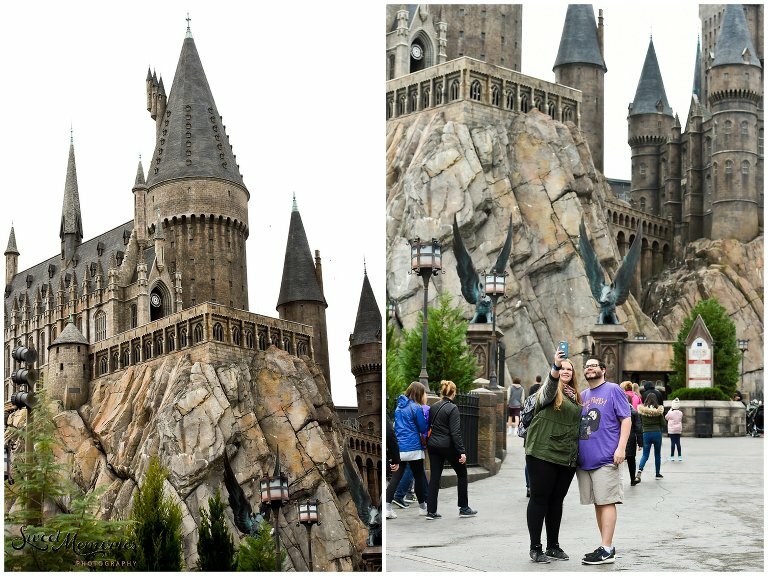 This is the story of Zachary and Sara’s proposal at the Wizarding World of Harry Potter. It was a dating app that brought the couple together. What started out as a joke (joining the app for giggles) turned into fate. They were always meant to find each other … Tinder just sped up the process! These two have been together since June 2017, and it didn’t take long for Zachary to know that she was the one. During my phone consultations with Zachary, I found out that these two are complete opposites. But only in the ways that compliment and balance each other. Just a few examples: Sara is a huge book reader, is in advertising, and hates Mexican food. Zachary, on the other hand, is obsessed with sports, works for the University of Michigan, and loves Mexican food. The ways that they are similar are the ones that really matter. For instance, they are both Harry Potter fans, love dogs (their two will be in their wedding), and both have such big hearts and love for one another. Zachary had been planning this proposal for a while. Originally, he was going to propose at Disney’s Magic Kingdom. That is until Sara made a comment a while ago that proposals at Disney World are way overdone. Plans changed. It became Zachary’s priority to make sure he organized the most epic Harry Potter proposal. Months later, he did what he had always refused to do before. He opened up a credit card. Now, if you know Zachary, like Sara does, he refuses to use credit cards. He absolutely despises them. But for love and for Sara, he opened one up so he could get her the ring of her dreams. Michigan got hit by a bad snow storm. Flight after flight got canceled. Can you imagine Zachary’s state of mind!?! Luckily, they got a flight and made it to Orlando (a day later, but they got there!). Nothing ever goes as planned. That’s why you have to be ready for anything! Our original plan had Zachary finding his mark (which I placed when I first arrived), taking a selfie on that spot, and per the norm, Sara needing to inspect the selfie to make sure it looked good. When she was busy inspecting the photo, Zachary would kneel and propose. The mark, which was a Harry Potter temporary sticker, was kicked and ended up on the bottom of someone’s sneaker. Luckily, I had taken and sent him a picture of where he was to stand so that, even without the sticker, he’d know the general area. Then, I noticed a group of ten people stop on his mark. And they stuck around. They wouldn’t leave. Yup. Still there. Okay, we can work with that. Zachary asked someone to take their picture and then they proceeded towards the mark. You know, the mark where ten people are chilling. I could see Zachary looking around. He pretends that he dropped something so he goes looking for his <invisible> something. I see him shrug, motion to Sara for a selfie next to the group of ten people. And we are back on track. They take a selfie, Sara inspects it, and Zachary drops down on one knee. The butterbeer vendor surprised them with a cup of the buttery goodness to celebrate their engagement. Unfortunately, they weren’t huge fans haha! Sara and Zachary’s adventure begins! They solemnly swear that they are up to no good down here in Knockturn Alley: I personally love this feature at 9 3/4! The engaged couple is off to catch the train! Is it just me or is it a bit steamy over here?! Just practicing for their first dance as husband and wife, while respecting the spell limits. Can anyone guess which wizard this belongs to? Hint: he only has one eye. And the bling on it belongs to wizard, Sara. Because who doesn’t need some sweet in their life?! Congratulations to the happy couple! Happy wedding planning! Wishing you both a wonderful adventure full of love and magic! ©Sweet Memories Photography, the proud photographer of Zachary and Sara’s proposal at the Wizarding World of Harry Potter!